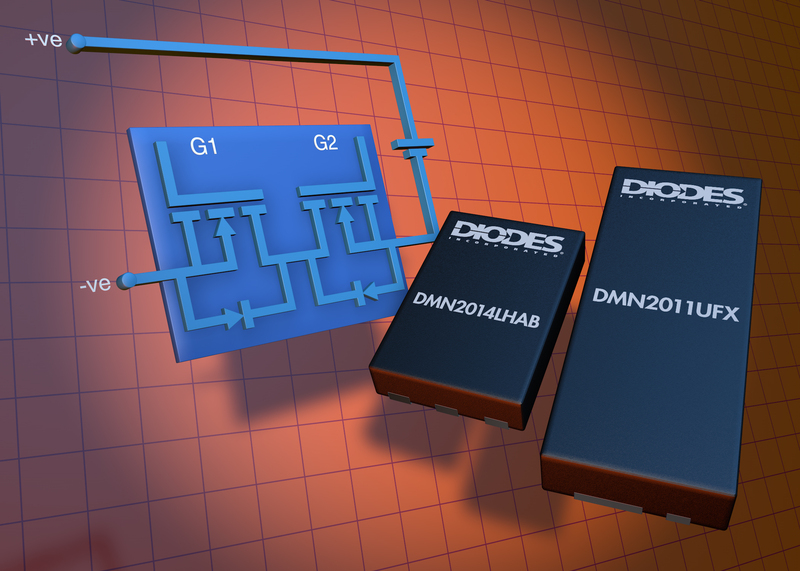 The DMN2014LHAB and DMN2011UFX dual N-channel enhancement mode MOSFETs, introduced by Diodes Incorporated, provide a compact, bi-directional low-loss switch for battery-charging circuits. End-markets include chargers for portable devices such as smartphones, tablets, cameras and media players, which use 1-cell and 2-cell lithium batteries. With a 20V breakdown rating, the DMN2014LHAB and DMN2011UFX also feature low on resistance, RDS(on) < 13mΩ and < 9.5mΩ respectively, to reduce battery power loss in normal operation. A high maximum peak current up to 80A allows the switch to briefly handle short-circuit conditions before the protection circuitry kicks in, while a low gate threshold voltage, VGS(th) <1V, ensures correct operation even with drive voltages as low as 1.8V. The DMN2014LHAB is available in the tiny 2mm x 3mm DFN2030 package and the DMN2011UFX is offered in the 2mm x 5mm DFN2050, providing small form-factor solutions that allow designers to use the space saved for additional cells and increase the battery’s mAh capacity.